Up until the final moments of the meet, it could have been anybody’s victory. At least, the main competition was between the Blue and Green house athletes. This as the Maude Smith Pre School held its annual sports meet under the patronage of former student and budding Architect, Steadroy Brand. 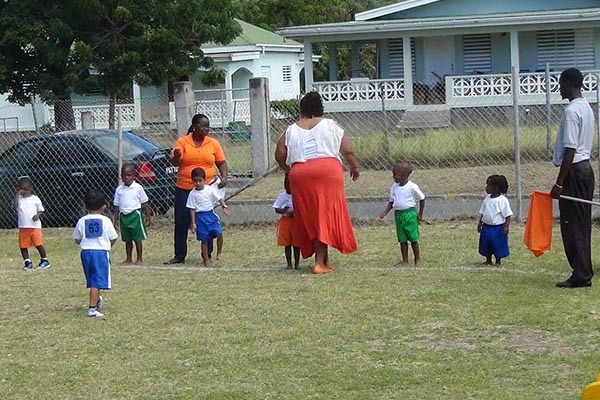 The meet was held at the school’s grounds in Bath Village and saw the athletes competing in such events as: fruit basket; fill the bottle; thread the roll; bean bag race; spoon and block; tyre race; hula hoop race; flat races and dress up race. The Teachers and the parents also tested their skills in a couple of exciting flat races.